Making struts to hold the lift gate on the Aerolid up in the air high enough to point at a 8 ft height off the ground 4 ft behind the truck for travel trailer towing. I will install another set of struts in front of the one shown to triangulate the sides. Then we want to install bracing across the back to triangulate the lift gate transversely. After the bracing gets built I need to fabricate side curtains which I will U Bolt to the side struts. 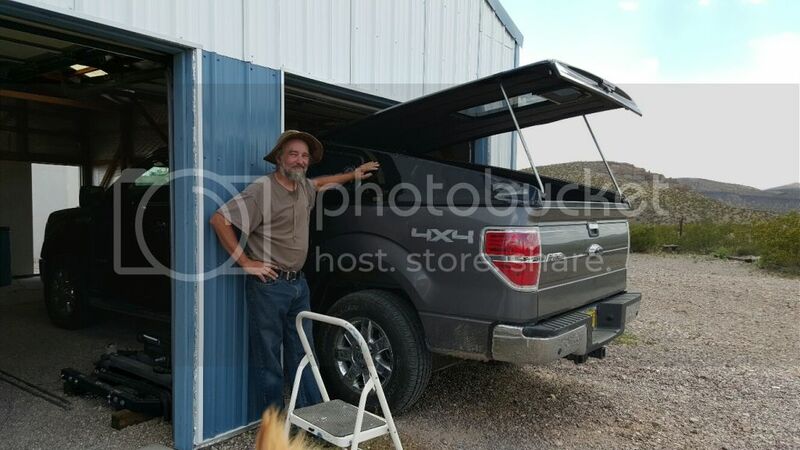 The whole assemblage will remain open in the back when I am towing the trailer. The fiberglass is not set up to take a load at the lift gate lock so I put these wood blocks under the locking mechanism to take the stress. When I get the other trusses installed it will be better. I took this rig for a 10 miles test drive at 55 mph. I went 5 miles then turned around and tested back the other way. I registered 23.6 mpg going south and 23.2 mpg coming back for a average of 23.4 mpg. Not bad as I can get 26.4 mph easily with the lid closed. This means that having the lift gate open like this is a 3 mpg penalty at least maybe a little more. When I enclose the sides it will be a whole different creature. No point in this rigging if I am not towing a trailer. The question is will it improve trailer towing mpg over having the lift gate closed in its normal position? The sides ought to offer more support if I can get a good fit after hardening the foam board and U Bolting them to the the struts. 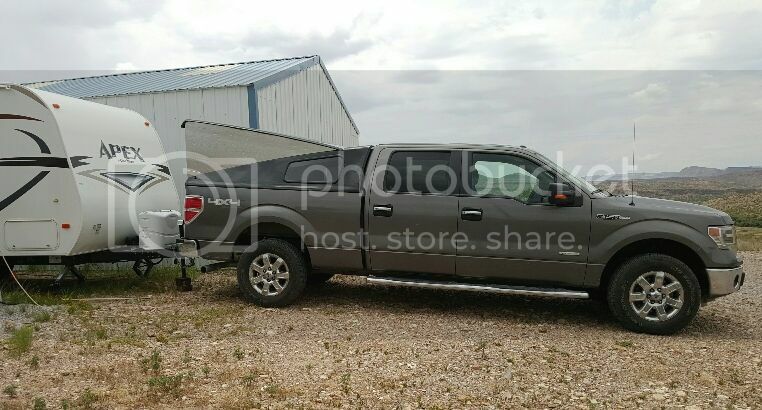 For sure it will help pulling a trailer, i have had good results with a similar setup to pull enclosed trailer... see thread http://ecomodder.com/forum/showthrea...p-30843-3.html post 30 page 3 has a pic. I use two ratcheting tie downs to cross brace the rear above the tail gate. Absolute numbers are of interest, but the percentage change is what counts when talking about RV fuel economy. The fuel burn penalty range is at least 30% for most vehicles, and 40% probably the norm. Over forty is, IMO, poor driving skill as well as poor combined vehicle lash-up ( as well as steering slop, bad tire pressure, worn suspensions, etc). Under thirty is more likely evidence of a motivated driver. I've been postulating that an EM reader can, with the right set up, keep losses under 30%. 4] Towing, with Aerolid configured for towing. First, the question by other RV'ers will be how are the pair of vehicles loaded? For the TV it will need to be with full fuel, regular gear aboard, and loaded for travel (inclusive of passengers, etc). Same for the TT: full fresh water, full propane, standard gear aboard and then loaded for a trip. In each case, weight representative by sand bags, etc can be done (with a pass across the scales on a regular vacation trip to verify). The published base weight for your vehicle as against the actual base weight of driver, full fuel and standard gear aboard. The true solo weight. Then the solo weight as for travel. Same for trailer. An initial trip to the scales for adjusted (true) base weight, short of passengers and per trip extras in both vehicles. 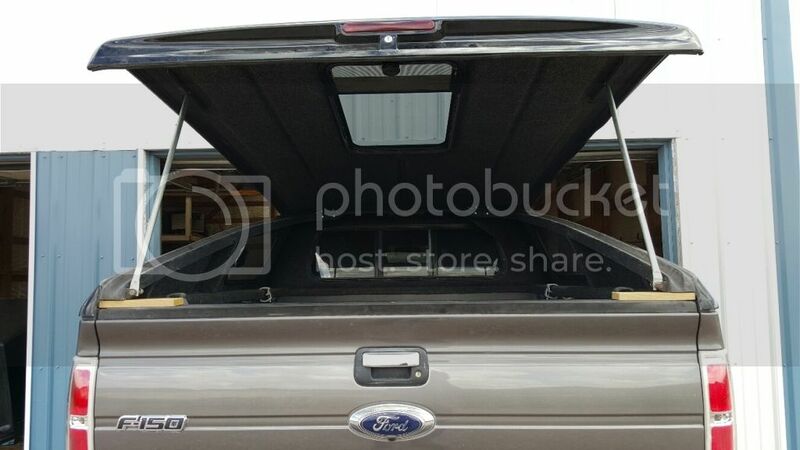 Second, it will be brought up the in [1 & 2] that an open bed can be modified by a partial tonneau that covers the last 50-60% of the bed so as to equalize pressure against both sides of the tailgate. A piece of plywood would work. This is against what one would assume you already have as solo highway travel in your records as an average (same speed as when towing, on cruise control). I would want to use an Interstate for the test course so, again, to keep results most consistent with one another. And I would think a distance of 100-miles both outbound and inbound, but leave that point alone otherwise. Second, a default setting for the weight distribution hitch needs to be set. 100% FALR would be my suggestion (where the TV front axle is returned to its solo weight value), or one can work with more current, but contentious OEM values of 50% plus. For more on this, see article by Andrew Thomson in his column, Hitch Hints, in Vol. 44 #1 of RV Lifestyles magazine, 2015 Buyers Guide, Nov. 2014, Page Six. (Can't figure how to set link with phone). As well, a trailer axle alignment plus brakes and bearing preset verified as well as trailer tires to full sidewall pressure. As in other posts recommending this avenue of pursuit to bring steering corrections to their lowest point and for best braking/handling performance, equalizing the axle pair via loading as seen on a scale per wheel position as well as each axle is to the point of repeatable results. A trailer even slightly out of alignment and with unequal loads cross axle and per axle will track differently in changed winds (outbound and inbound on the test course). Skewing your results for no good reason past poor preparation. That it will reduce tractive drag is all to the point of the testing. Same for truck, but where the alignment is verified, brake caliper drag is not apparent, and tire pressures are within OEM door placard spec. The percentage change from solo to towing, over the possible range of changes, is then closest to accurate. Or, can be repeated by others where combined rig variables are minimized. To round out variables for comparisons by others. The point would be, long term, to be able to predict average fuel cost on a per mile basis. Cents per mile (as is used in business calculations). I know I keep pushing these things, but there are plenty of savvy RV'ers who would be interested in the results. Not covering the above leaves, then, too many ways to ignore results you've already spent time and money upon. Being just slightly painstaking about WDH set up and lowering tractive drag will obtain results consistent enough to silence skeptics. That it is neither a fluke or just a stunt. Not "real world". I'll put it another way. Give me your rig and let me correct problems, optimize, and I'll show a better percentage change than with A-lid alone. The real problem for combined rigs is in wind handling, not aerodynamic drag (as that is a function of design). The real world has crosswinds and bad road surfaces to deal with. Average towing mpg takes its hits ( as well as safe traveling challenges) from these. Tracking percentage mpg change is the key. Optimal baseline is in correcting all mechanical deficiencies first. Last edited by slowmover; 06-07-2015 at 08:15 AM.. In my own case the penalty "average" has been 34%. Done at a higher speed than I now use. The current goal is to hit a higher mpg number that would reduce my fuel burn from 17-cpm to around 14 if I'm remembering the per gallon cost I last calculated. And be just under 30%. From 25-mpg solo to 17.5 towing if I'm at all lucky. A one ton pulling a 35' travel trailer. To be able to "use" your tests in consideration of a deflector on my bed topper, the elimination of variables, as well as tractive drag problems, would need to be in place. Despite all the other potential problems, I can also look to RDefayettes aerolid on his twin to my truck as a base. From two angles. This proposed set of tests by you then leaves the door open for further changes. Better tires for FE on truck. Other potential upgrades to same. Upgraded tires on trailer to avoid interply shear problems. Trailer suspension upgrades to decrease tracking problems. And a VPP style hitch to pretty much eliminate tracking difficulties altogether given increased wheel travel and shock absorber installation already done. A better trailer is the final piece of the puzzle should that ever appeal. Bigfoot, Airstream, Oliver, etc. That these will about last forever is the reason for having one, versus the short one decade life of a conventional square white box. A used trailer of these brands is more than economical. Last edited by slowmover; 06-07-2015 at 08:10 AM.. ...........The real problem for combined rigs is in wind handling, not aerodynamic drag (as that is a function of design). The real world has crosswinds and bad road surfaces to deal with. Average towing mpg takes its hits ( as well as safe traveling challenges) from these. Tracking percentage mpg change is the key. Optimal baseline is in correcting all mechanical deficiencies first. . I like that statement. there are a lot more things to consider than just aero drag. Here is the concept. 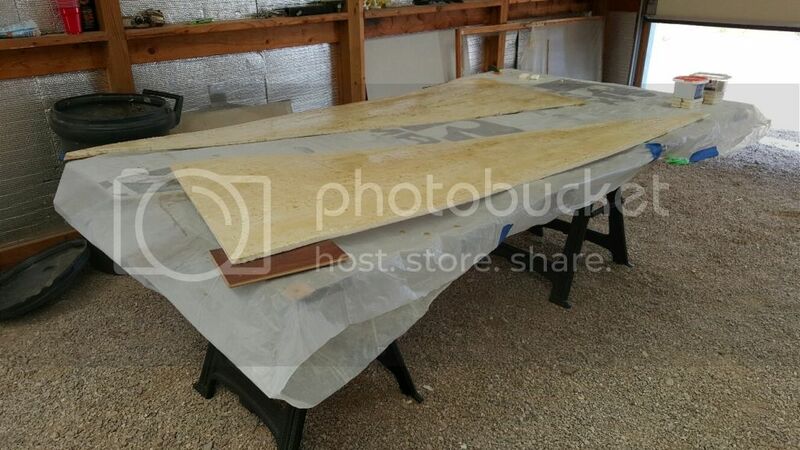 Now I need to get to doping the fiberglass resin on to the panels. It is looking like I need a total of four 2inch spacers and 3&1/2 inch to 4 inch U Bolts to attach the panels to the truck. When the panels are done I will paint them black. I also need to pick up one more joint of conduit so I can make the back braces. I appreciate all your input but I have to tell you I don't usually tow that trailer anywhere unless I am going camping. It is just too expensive. At $3.00 a gallon and 12 mpg it cost $25 per 100 miles to tow it. Testing is usually done when I am traveling for any other reason. I used to average 12 mpg towing this trailer with a Toyota 4 Runner. Same engine my truck has but it was normally aspirated. The 3.5 L V-6 in the 4 Runner produced 270 HP. The 3.5 L in the Ford F-150 has twin turbo chargers, and produces 365 HP and 420 ft Lbs of torque. If I can best 12 MPG I will be happy with it. Even if I can do the same I will be happy with it. We are going to sell the trailer in a year or two as we are looking to buy a 5th wheel. 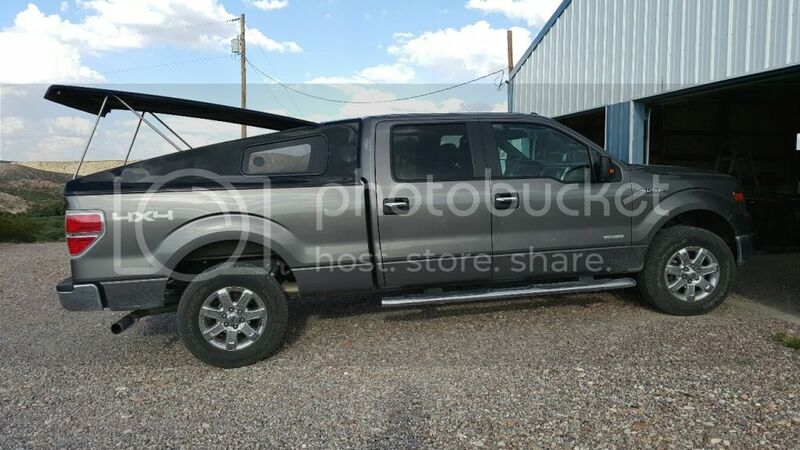 That will be a whole new towing paradigm. But in the mean time we shall see what we can do with Apex. We are traveling to Roper Lake State Park in Arizona on June 19th so I am trying to get ready for that. Fairly fast learning curve here. Tomorrow we will flip the pieces, strip the paper, and lay down fiberglass resin on the other side. I have the blocks cut and glued for spacers between the panels and the struts. This morning I drove at 45 mph with the panels on with the spacers taped on and it held up well. I need four 4 inch U Bolts for anchoring the panels to the struts.